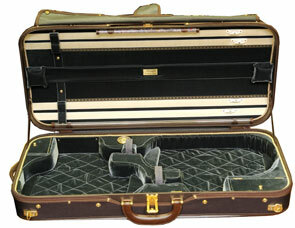 Cases for Two Violins, or Combination Violin and Viola from Bobelock, Musafia, Pro Tec and Bam. 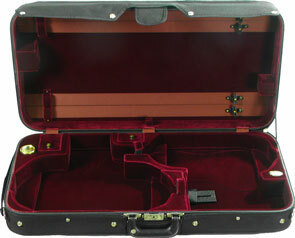 We are offering FREE Shipping on Musafia and Bam cases. To get this offer, add a case to your shopping cart. Then, return to this page, and click on this Icon. You will see a credit in your shopping cart to offset the cost of standard domestic shipping. 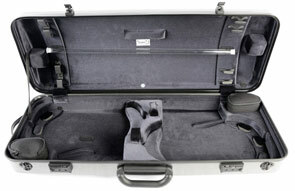 Idea shell offers light weight and high level of protection. Backpack straps. Attached sheet music pocket. 4 bow holders. Accessory pocket. 7.7 pounds. Lightest Idea shell, but still offers a very high of protection. Backpack straps. Attached sheet music pocket. 4 bow holders. Accessory pocket. Black high gloss exterior with Black interior. 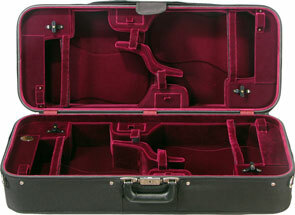 Wooden case holds four violins. Black canvas exterior. Non suspension. 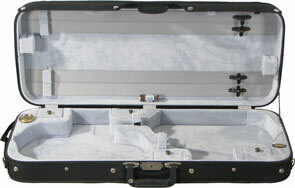 Velvet interior has four bowholders, four accessory pockets, and instrument blanket. Shoulder strap. 14 Pounds. 4/4 only. 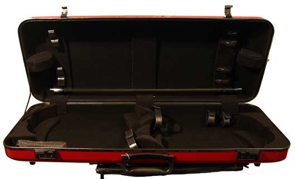 Hygrometer, suspension, Wine Velvet interior, Black exterior with music pocket, strap, bow tube, instrument blanket. Wine Interior. 4/4 Only. 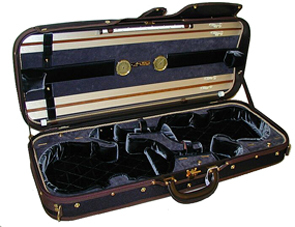 Classic shell is made from foam and plastic. It is lightweight, and offers excellent thermal protection. 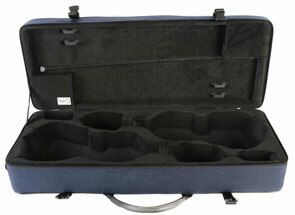 Backpack straps, four bow holders, velvet interior, subway handle and full length music pocket. 7.5 Pounds. 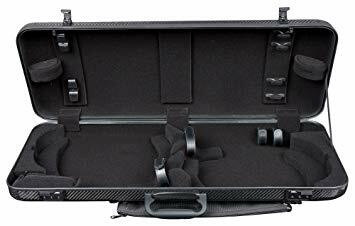 The High Tech shell is a layered ABS with Airex Core. It's very strong, and light. 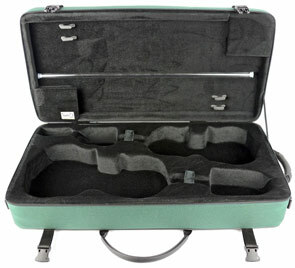 Four Bow holders, Suspension padding, two small accessory compartments. No exterior pocket. Classic shell is made from foam and plastic. It is lightweight, and offers excellent thermal protection. 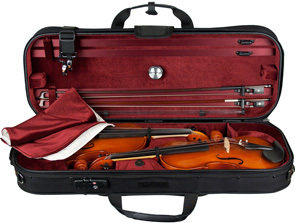 Backpack straps, four bow holders, velvet interior, subway handle and full length music pocket. 8.5 Pounds. Reinforced shell, olive wood interior accent trim, and French-Fit interior. 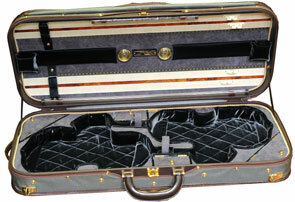 Master Series Oblong has 2 additional interior compartments and all have selected gold plated metal parts upgrade. 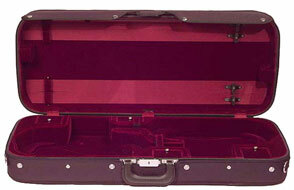 Addition of thermometer, Silk Velvet interior. 7.5 pounds (3.4 Kg). Reinforced shell, olive wood interior accent trim, and French-Fit interior. 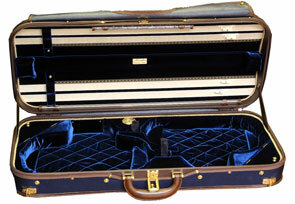 Master Series Oblong has 2 additional interior compartments and all have selected gold plated metal parts upgrade. Addition of thermometer. Coordinated Silk/Royale interior. 7.5 pounds (3.4 Kg).